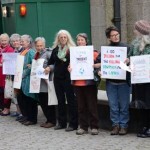 WILPF Cornwall, together with Women’s Aid Penzance and SEEDS (Survivors Empowering Educating Domestic Abuse Services) are calling all women. Assert the right to walk safely at night! Join us Friday 25th November 2016 From St John’s Hall, Penzance, 5.30 pm. Demonstrate your freedom, your concern, your power! Bring along your mothers, grandmothers, sisters, aunts, nieces and daughters! Also inviting men to support from the sidelines! 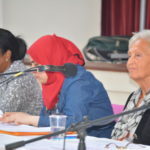 WILPF (Cornwall Branch) organized a highly successful event in St John’s Hall Penzance on July 16 to witness and experience the personal accounts of four women peace activists from the Middle East and North Africa. The event began with short scene-setting speeches from: Amira Elwakil from Egypt; Muzna Al-Naib from Syria; Sahar Mediha Al-Naas from Libya; and Zaynab El Sawi from Sudan. 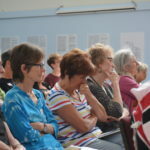 Over seventy participants from West Cornwall then engaged in a series of interactive workshops to better understand the contributions that each of the women had made and were continuing to make toward peace-making in their countries. Representatives from several local organizations involved in peace and development also supported and participated in the event. These collaborative organizations included: Amnesty; Children of Peace; CND; Dor Kemmyn Interfaith Forum; Freedom from Torture; and OXFAM. In the words of one participant the event provided: “invaluable information about a number of like-minded causes and the speakers – absolutely unforgettable. Moving. Inspiring. Engaging. Heart-breaking too”. We are honoured to share with you this extraordinary opportunity to join five women from the MENA Region who are coming to Penzance to share with us their own accounts about the uprisings and situations in their countries. These are womens’ stories. Stories of resistance and courage to bring about change. They will share the challenges they face and how they are overcoming them. There will be an opportunity for interactive question and answer sessions, refreshments, and information stalls from local organisations. Tickets available [£4.50-£6.50] from Eventbrite. More information about Conscientious Objectors in WW1 is available here. 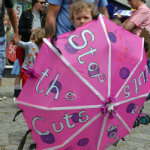 We will be outside Lloyds Bank, Market Place, Penzance. There will be music and poetry. Please bring your family and friends. Flyer available here for download and distribution. 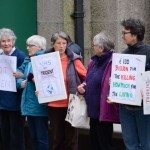 WILPF Cornwall branch invited those unable to travel to London to support the National Anti Austerity Rally, called by the People’s Assembly on Saturday 20 June, to gather in Penzance from 1.00-2.00pm to show their support and belief that the cuts are unfair, unjust, unnecessary. 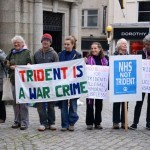 We also made a strong demand to Scrap Trident nuclear missiles and and cancel their replacement. Another woman said: “The cuts are hitting women hardest: women are 2/3 of public sector workers losing jobs in the cuts, over 2/3 of the money from planned changes to taxes and benefits will come from women, many women have to become the carers when welfare services are cut. We need to invest to create jobs and halt unemployment. Money could be raised from £120bn tax evasion, avoidance and non-payment by the rich”. 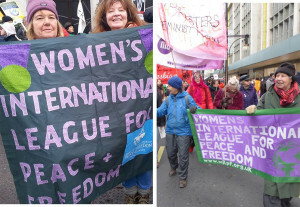 WILPF were also delighted with the turnout and the presence of local organisations: ‘Amazing Leftie Women’, ‘Cornwall Anti-Cuts Alliance’, ‘Cornwall Against the Tories’, ‘Unite’ and others who did not wish to be named. and with many others across the world, protesting about military spending.